Sometimes, the Gun Debate Shoots Itself in the Foot. It wasn’t but days ago that a local news channel ran breaking news about a little boy fatally shooting his sister with his gun. It wasn’t a parent’s firearm. It wasn’t a stray gun tucked away in a closet. It was a child-sized rifle given to the child as a gift. Now, this has become national news. Children involved in accidental shootings is nothing new, but it is rare that an incident comes along where it is the child’s own gun at play rather than an adult’s firearm being appropriated. A mother stepped away but for a moment, and heartbreak occurred. The five year old wasn’t ignorant of guns as the father was a hunter, but the mother says they, as parents, had no idea at all there was a bullet in the gun. To say that a small rural town is far removed from the national debate over gun control is ignorant. These are places where weapons are as common place as pots and pans. They are as much a way of life as they are simply just recreational or protective tools. It’s natural that any community would be dumbfounded to have this sort of horror happen in their town. This particular tragedy adds a kink to the debate of background checks being a failsafe prevention tactic as it would be nearly impossible to ascertain what would pass or fail a child. There wouldn’t be an arrest record similar to that of an adult. Sure, there could be a checklist of potential warning signs. Would those signs be similar to what profilers look for in criminal cases, or would the signs be more along the milestones that chart a child’s mental and physical development? The background check could always be applied to the parent, as they would be the one purchasing the firearm, but if the parent fails, would the child have to wait until they’ve acquired enough years* to pass their own background check? The founder of lobbyist group Violence Policy Center seems to think that the industry is looking for new groups to market towards as the primary white male purchaser is getting older. He implies that ownership is in a decline but, if that were the case, it fails to explain the popularity of gun control as a debate topic. His solution is to legislate ownership in much the same way as tobacco and alcohol purchasing power. "We believe possession laws should mirror laws for purchase 18 for long guns, 21 for hand guns," John Sugarmann said. "The idea of putting a gun into a child's hand should be viewed as a crime." The rifle should have been checked forwards and backwards many times over before being gifted to a five year old with only a child’s limited understanding of guns. It is where the parents failed in this instance. It isn’t fair that this child will read about his actions as an objective bullet point many years from now. Something so personal, so life changing will have been used as fodder for one or both sides of what has become a controversial debate, but it speaks to what should jump ahead of background checks – firearm safety. Would the implementation of background checks, a required gun safety course, or age limitations on ownership have solved the recent gun tragedies? No, probably not, but they might just be a better start. 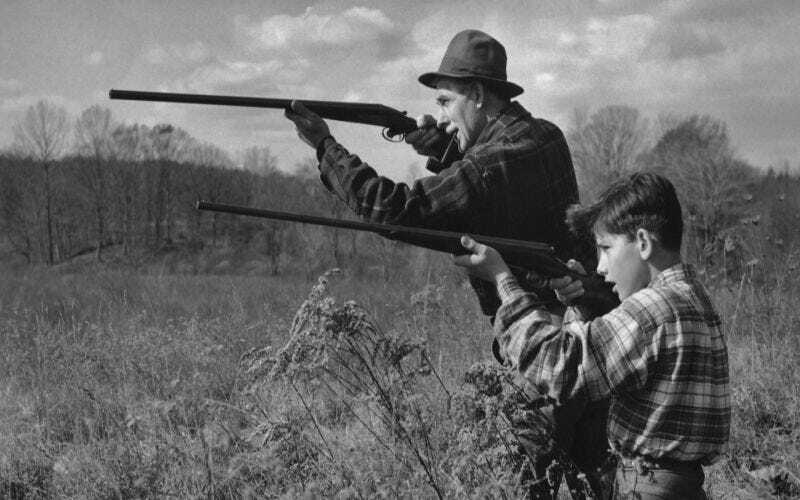 *In Burkesville, Kentucky a child must be nine years or older in order to gain certification after taking a series of hunting safety classes. Children younger than nine are allowed to sit in.